In the end, I decided to go with the same trim that I have on all of the doors simply because I’ll be putting only Roman shades on the front windows, and I really like the taller, more substantial trim used with Roman shades. 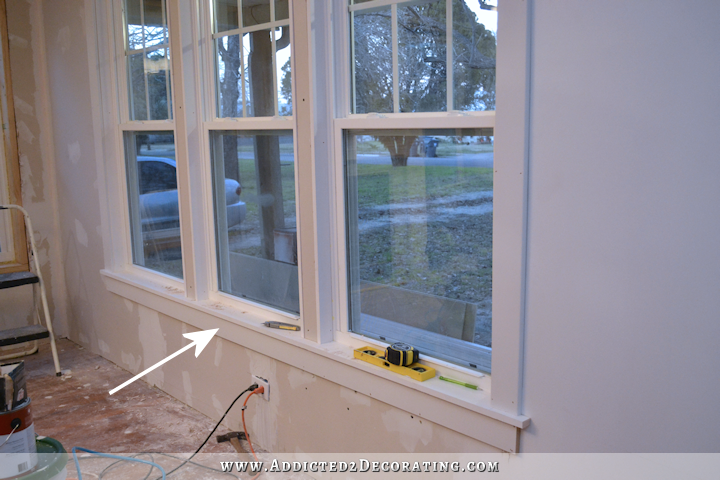 If I were going to use draperies on all of the windows, I would have used smaller trim. The first thing I did was cut and install the stool, and a 1 x 4 turned out to be the exact size (depth) that I needed for this. I used pre-primed pine fingerjoint boards for this. 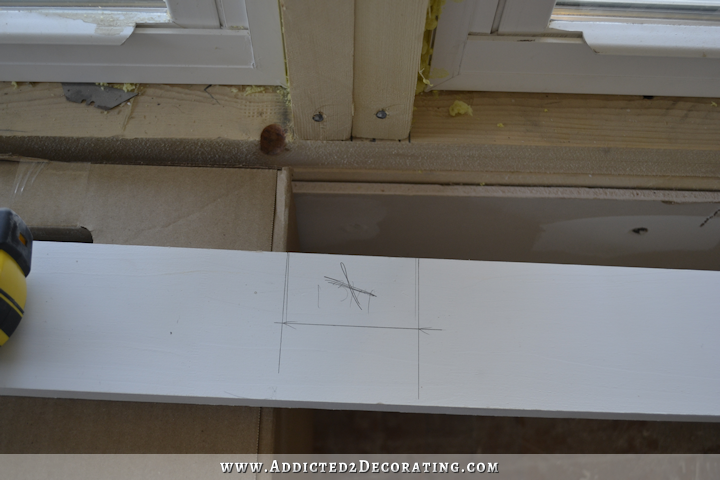 In order to mark where I needed to make my cuts, I placed the board on a drywall mud container and pushed it against the wall/windows as far as I could, and then used a straight edge (a small level) to mark make my marks. And then to be sure that my marks were perfectly square, I followed up with a framing square. A speed square is preferable for things like this, but I don’t own one of those. As I made my marks with the framing square, I also moved it over from my original marks about 1/16th inch just to give myself a bit of wiggle room. And I transferred that measurement to the board. I always put an “X” in the section that needs to be cut out to eliminate any potential for confusion once I take the board into the garage to cut it. I repeated that for every section that I needed to cut out to go around the framing and the walls on each end. 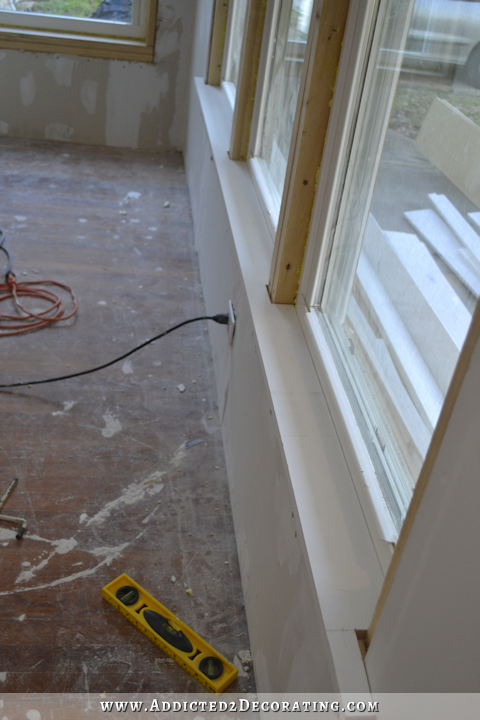 The amount I needed to cut on the ends to wrap around the walls was deeper since it had to wrap around drywall as well. The middle sections were only 1 3/4 inches deep, while the end sections that wrap around the walls were 2 3/16 inches deep to account for the drywall. Once I had all of my marks on the board, I cut out the notches with my jigsaw. I also cut the ends to the length I wanted them, making sure I left enough to extend just past the outer window casings. With everything cut, I tested the board to be sure it would fit properly, and then nailed it into place with 16-gauge finish nails. EDIT: I had someone ask how to make the cuts in the corners of the notches with a jigsaw, so hopefully this diagram will help. Cutting a squared notched requires four cuts with a jigsaw. The first and second cuts go from the edge of the board to the corners of your marked section that needs to be cut out. 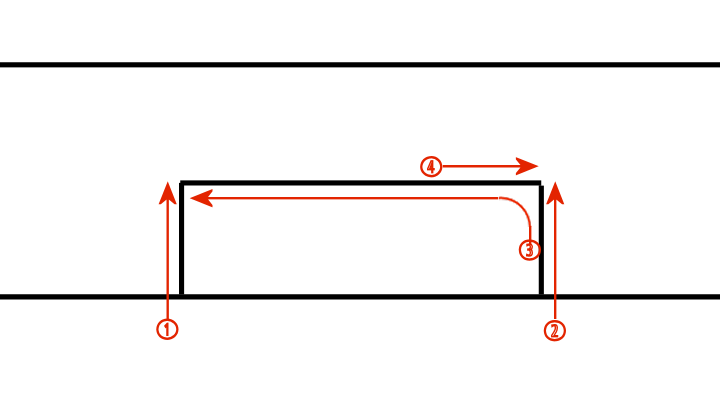 For the third cut, you start with your blade in the cut that you just made (cut #2), and curve your cut around until you hit the cut line, and continue cutting to the corner where you’ll meet cut #1. Then turn your saw around, and start along the cut line where you just cut, and continue to cut until your blade reaches cut #2 in the corner. Since you have to cut around a curve (cut #3), it’s easier if you can use a curve/detail blade on your jigsaw. But if you don’t have a curve/detail blade for your jigsaw, just give yourself plenty of room to make the curve with the larger blade. You can clean up that corner with cut #4. Next I covered the exposed framing boards with drywall. This wasn’t really needed, but I did like that it would give me something a little more substantial to nail the trim to later, rather than having empty space behind these trim pieces. Then I was ready to add the stops around the window. I started with the top stop, and I used the same pine fingerjoint board for the stops that I used for the stool. I had to use my table saw to rip this board to the exact width that I needed, which was 2 1/8 inches. With the top stops in, I moved on to the side stops. I had to rip these boards also, since they also needed to be 2 1/8 inches wide. 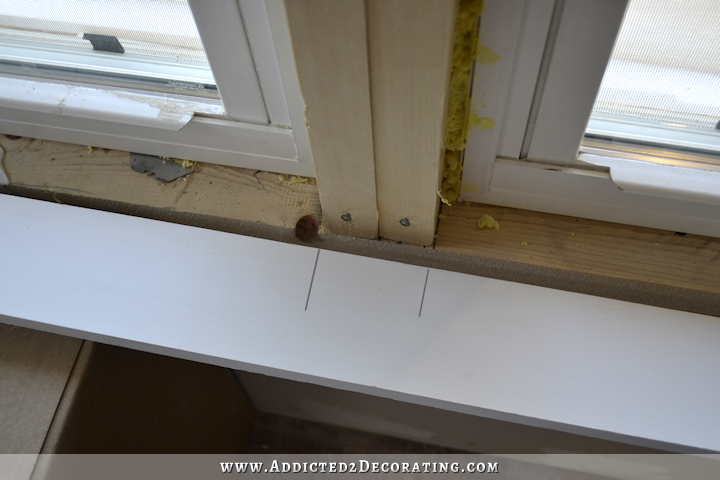 With the stool, all three top stops, and all six side stops installed, that finished out the trim around the inside of the window framing. Then it was on to the pretty stuff — the casings. I added the outside casings first, and for the casings, I used MDF boards. For the two outer side casings, I used 1 x 4’s, just like I use on my door casings. I also used a 1 x 4 for the apron below the stool. And then I added the top header casing, which was the same 1 x 6 sandwiched between two 1 x 2’s that I’ve used on all of my doors. I put this together on the floor using wood glue and 18-gauge nails, and then added lots of construction adhesive to the back, and lifted and placed it on top of the two side casing pieces and nailed it into place using 16-gauge finish nails. And to finish things up, I added the casings to the two center areas. The 1 x 4’s that I used for the outer casings weren’t quite wide enough for these two center areas, so I had to rip down some wider boards to fit. And that’s it! 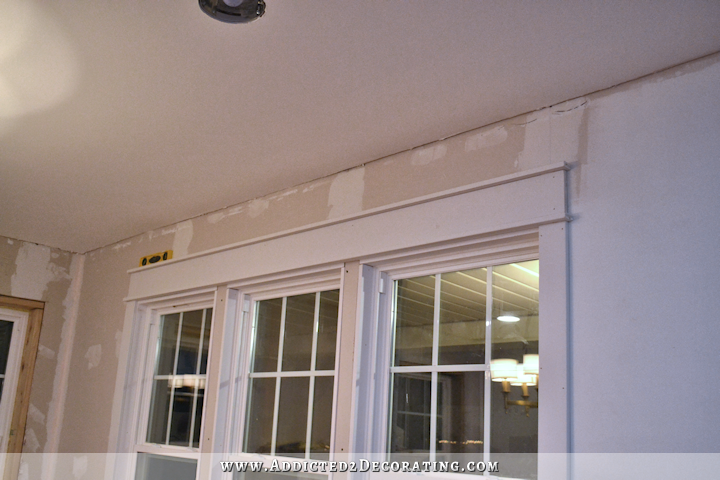 It’s really quite simple, and this particular style is probably the easiest to do since there’s no fancy trim that needs to be mitered and wrapped to return to the wall (like you have with casing headers that use crown moulidng) or anything like that. It’s all just plain boards with square cuts. The hardest thing about it is cutting the notches for the stool, but that goes quickly as long as you have a jigsaw. 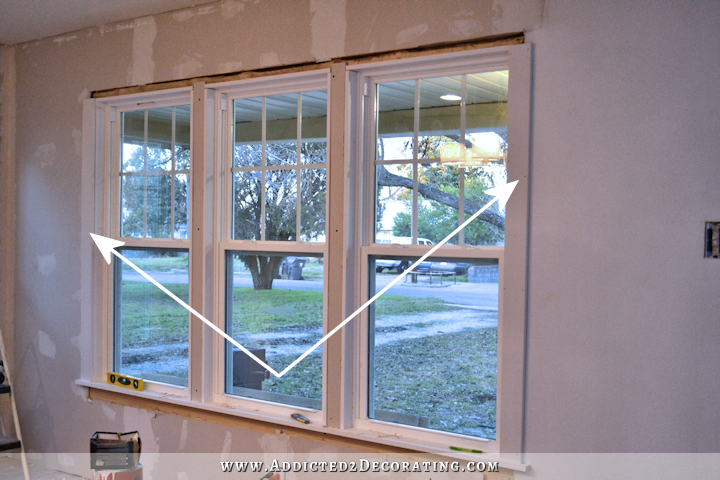 Here’s how the front windows looked when we bought the house. And here’s a better view of the front windows, but with the casings removed. And here are my new windows right after installation. And here’s the progress on the front windows. UPDATE: I got all of the windows trimmed out. Here’s how they all look so far. Wow what a transformation! I’m assuming caulking will be next if you haven’t already? 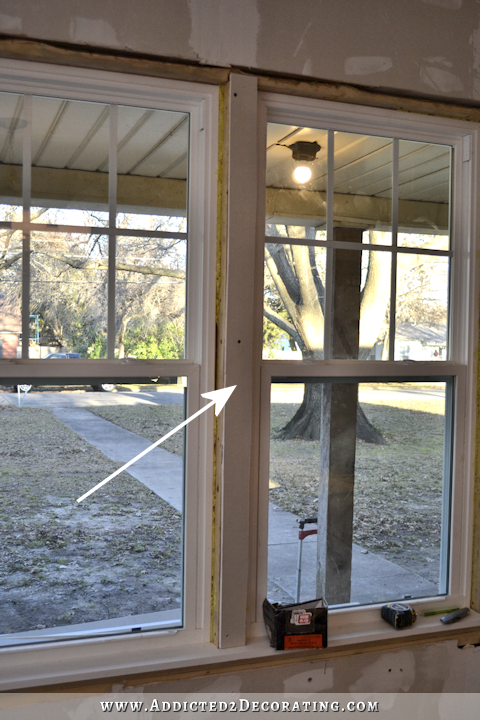 The reason I’m asking is I think our windows need some but I don’t know if there are rules about interior caulking like there are for exterior caulking (I’ve heard to leave the bottom uncaulked to let out moisture, etc). Do you just caulk everything as tightly as possible on the interior? I want to do that but don’t want to mess anything up. Thanks. 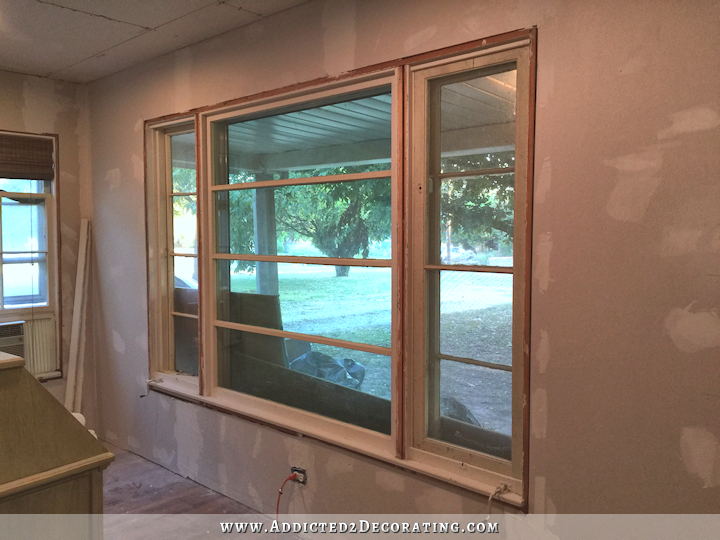 In my neck of the woods we fill the gaps around the windows with expandable foam before we start building and applying the trim. I suppose that’s because it’s colder up here in Canada than in Texas. It goes a long way to preventing any drafts around the windows and fills up spaces were moisture might build up with the temperature shifts. We do that here, too. It shows in the second picture in this post. That was before I cut away the excess that oozed out as it was expanding. That is so beautiful. 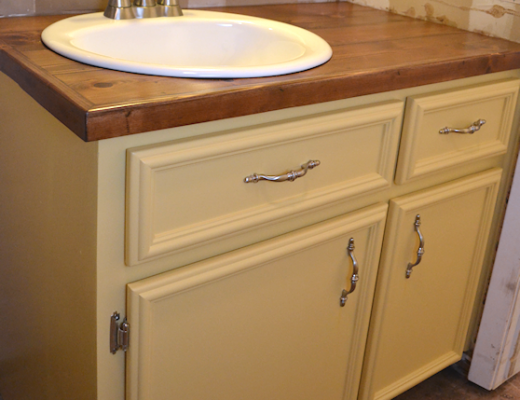 A contractor would never go to that amount of work, and it’s those extra touches that really make a home stand out. I’m so proud of you. Looks great! 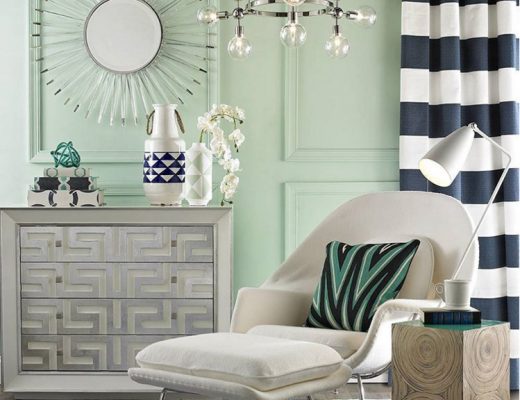 I think that will look fantastic with the roman shades. Really beautiful! Glad you broke it down as I have always wondered how that look was created. How do you make the inner cut when you are doing the notches? I can see how one would do the two straight cuts in, but can’t figure out how you make that final third cut in such a small place. But, what did you do about AC? I noticed your transformation didn’t include a window unit. We had an HVAC system installed last fall. I do a little reno here and there and I felt compelled to tell you this morning how grateful I am for your willingness to document each and every step of each and every project. I’m sure you would be done long ago if not for us. I have sent countless people to your blog when they ask for my advice on things I haven’t done….You are my voice! I may never tackle the in-depth projects you do, but if I ever do, your blog will be my go to for how to. Thank you for sharing with us, for answering our questions, and for graciously overlooking our sometimes rude, hurtful, and, yes, ignorant comments. Awsome look and windows and great tutorial! I could do this! Looks wonderful! 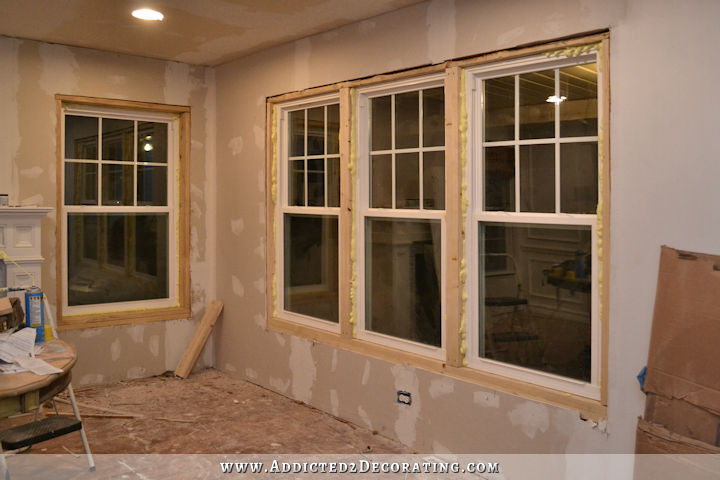 What a transformation over the old windows! 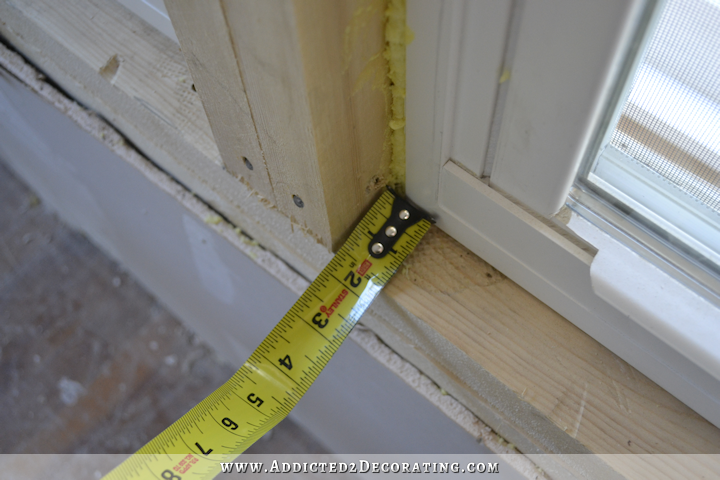 Two questions – when measuring for your stops, you measure from the window to the outside of the drywall, right? 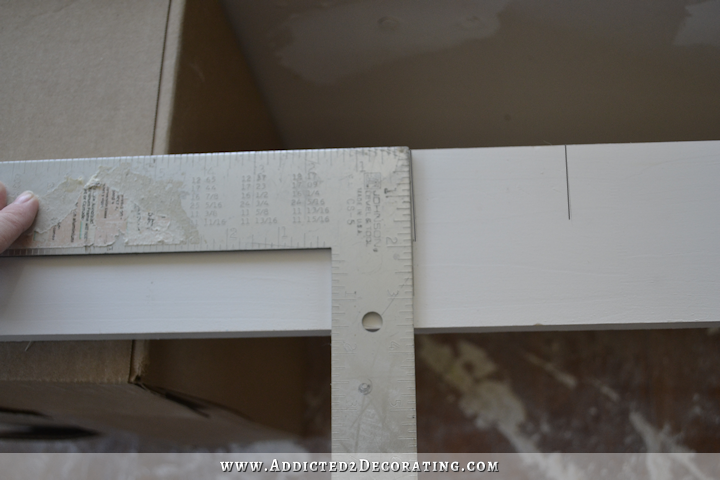 and when measuring your trim to go over the stops, do you allow for a little step-back reveal, maybe 1/4 inch? 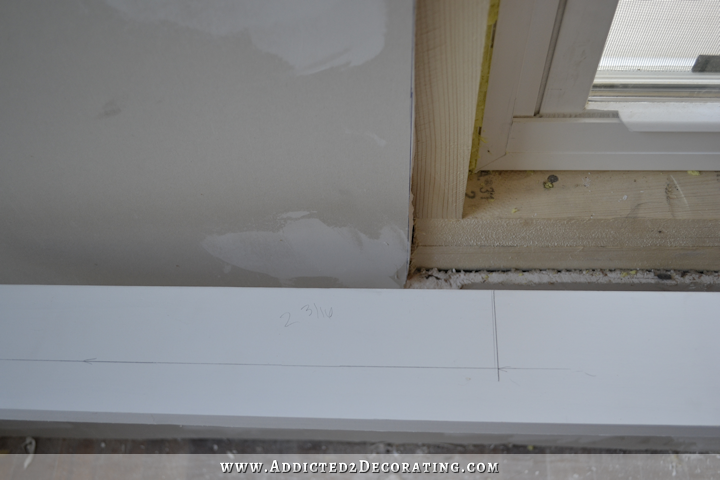 Yes, I measure from the window to the edge of the drywall. That’s another reason I added the drywall to the inside framing — so that I wouldn’t forget to allow for drywall when cutting those stops. 🙂 Knowing me, if the drywall wasn’t there, I’d get ahead of myself, completely forget, cut them too narrow, and then have to make another trip to Home Depot to get more lumber. And yes, I leae about a 1/4-inch reveal on the stops. I do the same thing with door casings, leaving about a 1/4-inch reveal on the door jambs. But on this window, I actually made a mistake and made the vertical casing boards too long, so the reveal at the top is way bigger than what I normally do. I didn’t notice until I installed the top header, and considered taking everything off and cutting the side casing pieces down to reduce the reveal on the top stops, but decided not to worry about it. 😀 Once everything is finished and the room is decorated, I don’t think anyone will notice. Thanks for the tutorial Kristi! I was also wondering how you made those cuts with the jigsaw so I’m glad you explained it. 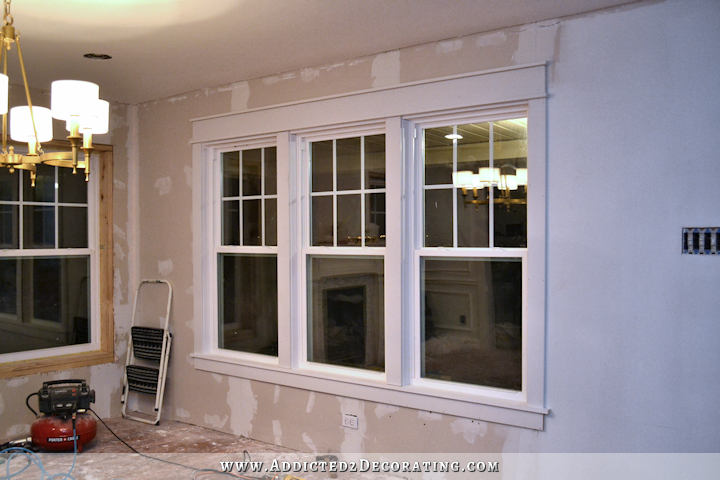 So are you noticing a more consistent temperature in your living room (soon to be dining room) with the new windows? Oh, it’s a night and day difference with the new windows! On the old ones, I could feel wind coming in around the panes. I can’t feel anything with these. It’s wonderful! Amazing before and after photos even at this point! 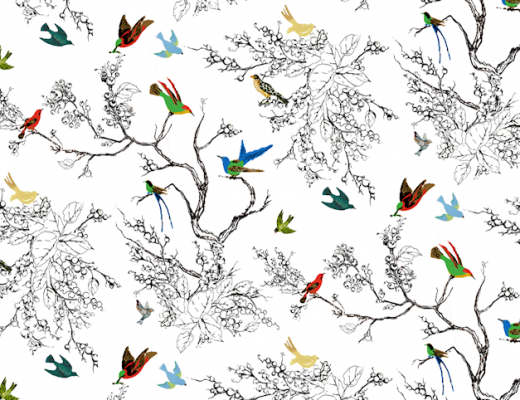 It may be easy to do for you, but it all looks quite complicated to me! Very impressive! Amazing! You did a really nice job. Good decision on matching it to the door headers. I so envy your talent. That looks awesome! You did a great job and I really like the classic style you used for your trim. I live in a plain 1900s mining house, so I go even more plain than you did, but it really matches what the original trim would look like. Nicely done and what an improvement. Would mind telling me the size of the replacement windows you used? The windows aren’t technically replacement windows. They’re new build windows. 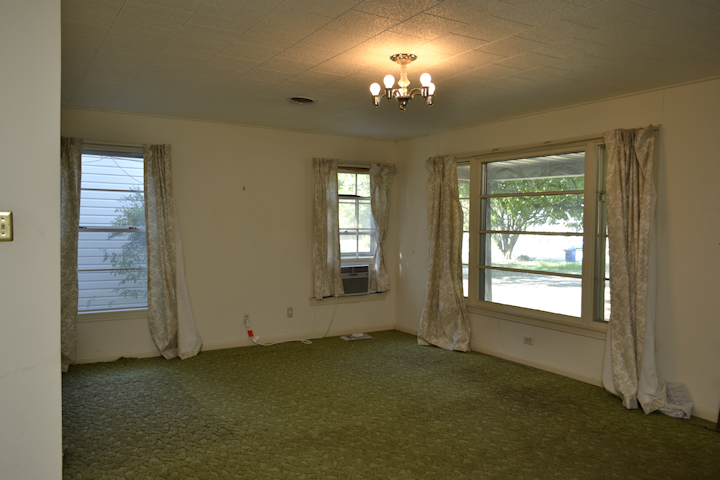 But the front windows are 60″ x 30″, and the fireplace wall windows are 60″ x 36″. Ah yes, of course. I have a similar arrangement on the front of our 1960’s cottage where I want to do a 3 mullioned and a single double hung on opposite sides of the front door. But I’m trying to figure out the right size and proportion. I have to reframe the openings so my options are open. Thanks for the info! Even though I “know” the room isn’t bigger, something about the windows just makes it seem more spacious. Love the window casings!! As a side note, throw away your step stool. I did and went and bought a new one. Couldn’t be happier as they have come a long way and are so much more stable. It will litterly be one of your best $50 spent. You don’t notice until you do it! Got mine at TJ Maxx. Looks great. These are my favorite style of casings. I got them at a local lumberyard called Gross-Yowell. The window brand is Showcase. Thank-you. My husband buys a lot from Gross Yowell and I had gotten window pricing for a new house. But the man had told me they don’t have double hung. After you responded, I went and asked about Showcase and I now ordered one to see how they look. Am wanting to see how easy they are to clean, and will probably end up getting those for my house. Thank you… Found your reply in my spam tonight, although I had checked on here before. 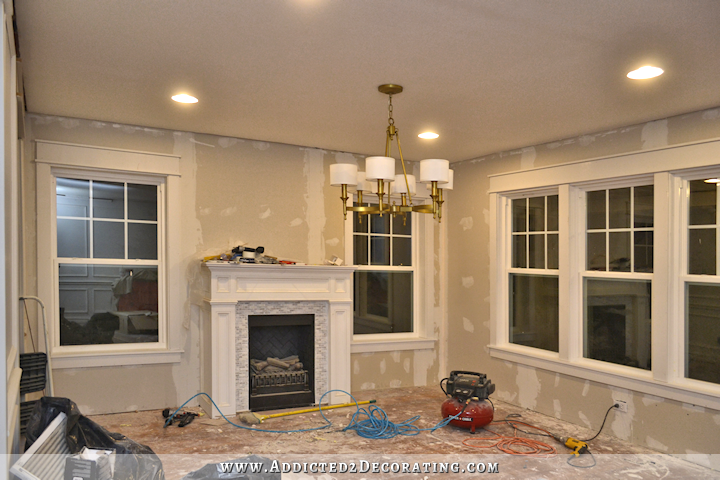 I never cease to be amazed at how much trim/mouldings make a difference in a room! Love watching the progress on your home! Is there any reason as to the different types of wood used or was your choice purely for ease of sizing and aesthetics? 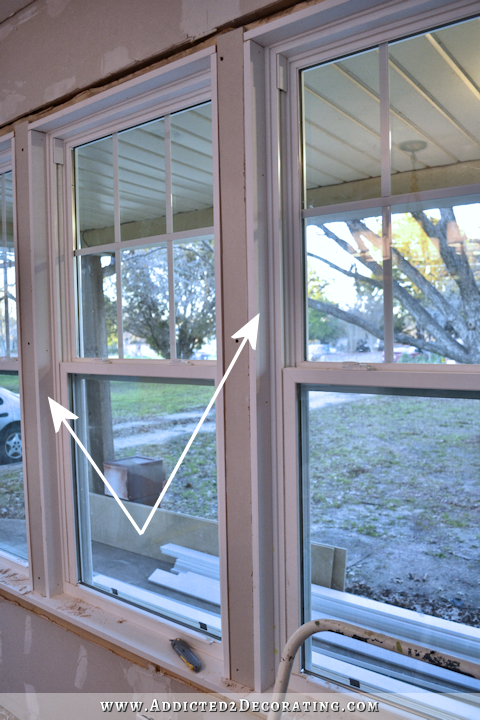 I want to do similar project with my windows and don’t know if I should be concerned with moisture/temperature concerns for the sill. I wanted to use real wood directly around the window just because it hold up to any possible moisture better than MDF. Plus, the pre-primed cuts down on my work, and it’s actually cheaper than the un-primed pine lumber. But then for the casings, I always use MDF just because I love the way that MDF is so perfectly smooth and has no wood grain texture that can show through paint. I also love the gently rounded edges on MDF boards, where real wood lumber has such harsh corners on it. It’s a very small detail, but it’s one that I think makes a big difference. When I use real wood lumber for anything that will really show, I always sand down those harsh edges to a gentle curve (called “breaking the edge”), and that’s very time-consuming. MDF boards eliminate the need for that and save time. And finally, I love how easy it is to sand MDF boards perfectly smooth, like after wood filling all of the nail holes. I have a much harder time getting a perfectly smooth finish after sanding real wood lumber. You are SO talented. God has truly touched you with a gift! 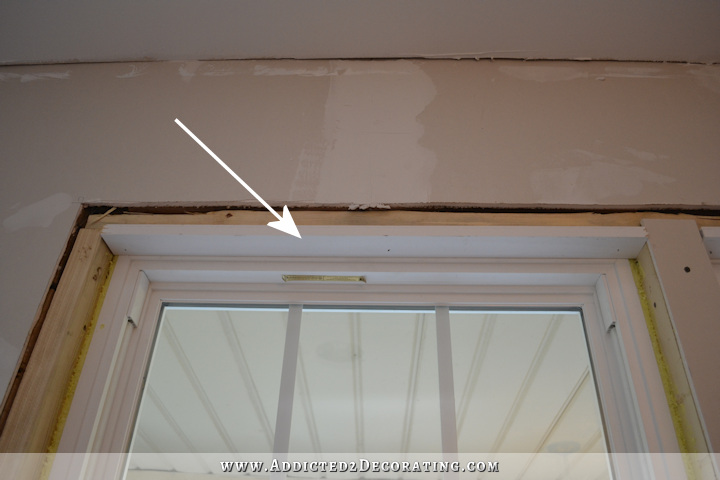 One question: do you remember the thickness of the drywall you used for covering the exposed framing boards? That would help me out a lot. I used 3/8″ drywall on the shiplap.